Register activity enables you to easily add and activate new systems in one step. Once your systems are registered, you can start using AirVantage. Enter your device serial number. AirVantage identifies your system type. If AirVantage does not identify your system type (or misidentifies your system type) when you enter the serial number, click Select system type in the top left corner. 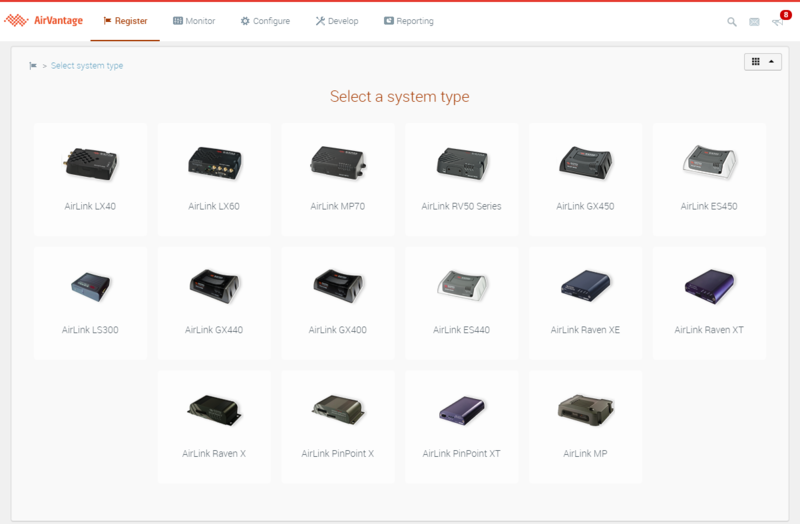 The device catalog appears,and you can select your system type from there. At first connection, AirVantage reads all the necessary information from the device and updates its database; based on the information returned by the device, the synchronization state will be shown. Clicking the synchronization icon will display details on the synchronization itself (warning, errors and other information). A system is created with the information you entered and added to the list: the last registered system is displayed first. These systems are displayed with the state NOT SYNCHRONIZED: they are activated but not synchronized yet. NOT SYNCHRONIZED YET. AirVantage server is waiting for the first system communication. SYNCHRONIZED. Most of the system information are stored in the server database. Some noticeable changes in your system can be seen from this status: device IP changed, SIM changed, firmware changed locally. SYNCHRONIZED WITH WARNING. The system has communicated and has been synchronized with some optional parameters not readable, the firmware or an embedded application is unknown in AirVantage, the SIM is already in use e.g. : phone number. SYNCHRONIZED WITH ERROR. The system has been synchronized but some critical information sent by the device is unknown or conflicting with other systems already created in AirVantage: For example, the Serial number, IMEI or SIM card is already registered for another system. For information on airtime usage, see Default Status Report Parameters and associated data consumption . This section provides you with a number of helpful task-oriented procedures showing you how to. How to Register a list of systems? How to configure my ALEOS gateway to communicate with AirVantage? How to configure my infrastructure when devices are communicating with ALMS through a VPN? How to configure my infrastructure when devices are in a private APN? How to register systems with an initial configuration?